Staying on mission is tough. Even, as I prepare for the mission it’s tough. God has used the stories of missionaries like Hudson Taylor, David Brainerd, and Mary Slessor to keep me moving. These men and women lived on the front-lines suffering for the sake of the name of Christ. Today, I will look at one missionary’s testimony of how he pressed through tough times. His name is Paul. In 2 Corinthians 2, Paul had just written a hard letter to Corinth and is anxious how it was received. So he sent Titus ahead to find out how they were doing. “When I came to Troas to preach the gospel of Christ, even though a door was opened for me in the Lord, my spirit was not at rest because I did not find my brother Titus there. So I took leave of them and went on to Macedonia.” (2 Corinthians 2:12-13) Although the door was open for Paul in Troas, He could not shake God’s moving to connect with Titus and the call to spread the gospel in Macedonia. Paul’s first image is common to Rome, “But thanks be to God, who in Christ always leads us in triumphal procession.” After a great victory there would be a parade. It wasn’t a parade of candy and clowns, rather a huge triumphant processional with rank after rank of trumpeters, streams of soldiers and senators, wagons of spoil, prisoners to be enslaved or executed, and ended with the hero or conquering general dressed ceremoniously riding a chariot. Along the route people cast flowers, burned incense or poured out perfume. Wonderful fragrances filled the air. So why does Paul use this illustration? It serves two purposes. On the one hand, Jesus is triumphant and Paul is in His service. But on the other hand, Jesus is like a heroic general and Paul is conquered and called to suffer in His service—even die. The word triumph is used one other place in the NT, Colossians 2:15, “[God] disarmed the rulers and authorities and put them to open shame, by triumphing over them in Him.” In Colossians, Paul says God leads the devil in triumph, but in 2 Corinthians, he says that God leads Paul in triumph. Both have been defeated in their rebellion against God. Both are being led in triumphal procession and shamed for their rebellion. However, there is a great difference, Paul is “in Christ.” He was defeated and taken captive; but he was brought to faith and forgiven, and became a joyful servant of the greatest General who ever was. Jesus, the One who conquered sin and death. Although Jesus was the one marched to His death, He rose victorious from the grave. He conquered death as the ultimate and final sacrifice for sin (Hebrews 9). 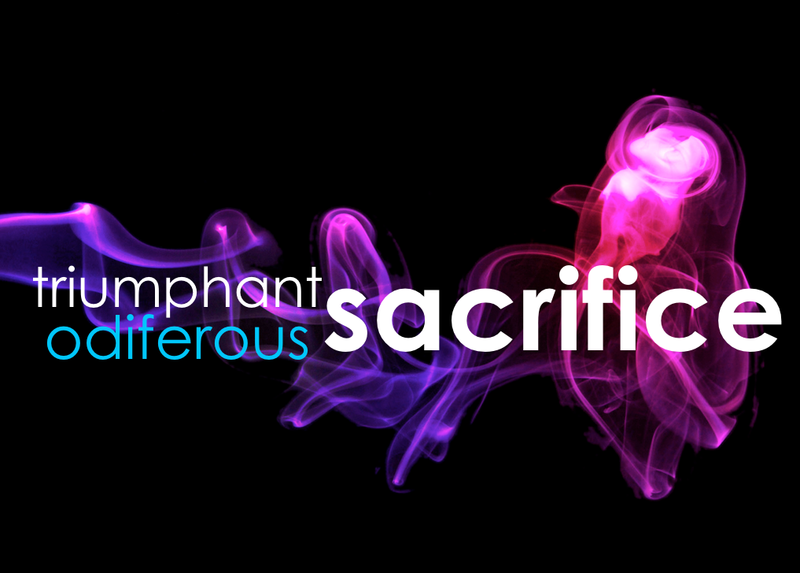 And it is Jesus’ sacrifice that gives Paul motivation to also give his life as a sacrifice to God (Romans 12:1-2). When you are finding ministry difficult, place yourself in the triumphant processional praising the name of Christ. Recognize your place in the parade and give thanks to your Hero. Paul second illustration is a continuation of his first, “And through us spreads the fragrance of the knowledge of Him everywhere.” Smells is a God-given sense that affect us all—for better and for worse. Smell alerts you to danger, such as, a building on fire. Animals use smell to survive. Smell tells you when someone else is around. There are delightful smells like freshly bake cookies, meat on the grill, fields of lavender, the smell of a little baby, or a new car. There are also putrid smells like dirty socks, moldy cheese, Mosinee’s paper mill, skunks,1 or even worse, a dead skunk. Also wrapped up in Paul’s message to Corinth are heart-rejoicing and heart-breaking words about missionary service: spreading the name of Christ pleases God, but it does not please everybody. His fragrance divides the world, “For we are the aroma of Christ to God among those who are being saved and among those who are perishing, to one a fragrance from death to death, to the other a fragrance from life to life.” To those on the side of Christ His smell is of victory and life (cf. Romans 10:15),2 but to those on the side contrary to Christ His smell is of defeat and impending death (John 15:18-25). As a bee makes sweet honey sweet to the taste, it can also sting too. So it is with the work of Christ and spreading His name to your neighbors and the nations. Don’t expect everyone to like the message or the you the messenger. Staying on mission is tough. Each day you face the temptation to cling tightly to your life, comforts, treasures, and self-sufficiency. Are you willing to lay down your treasures to treasure Him? May God lift your eyes to see His incomparable worthiness and may you without reservation place yourself in the triumphant processional giving sacrifices to your victorious Savior spreading His sweet and putrid fragrance to your neighbors and the nations.